Maybe it is the high oxygen content, maybe it is a latent primordial gene; whatever it is, I love the rainforest. Which is surprising because I hate being hot and sticky, and I’m not too keen on over-exerting myself. Still, there is something about exploring land that has not been changed by humans – well, not much – that appeals to me. 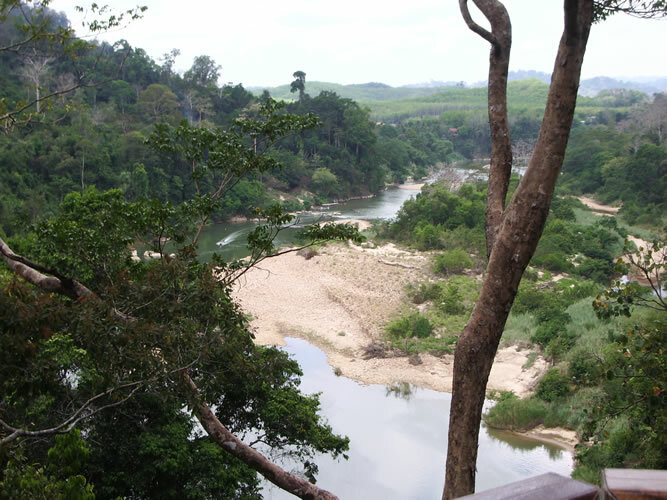 Bearing that in mind it is understandable that I felt drawn to Malaysia’s Taman Negara, the world’s oldest rainforest – a staggering 130 million years old – making it older than the Congo or Amazon. On the other hand I am also impressed with things new and shiny, so starting my adventure in Malaysia’s capital, Kuala Lumpur, better known as KL, was the perfect way to blend old and new into one trip. 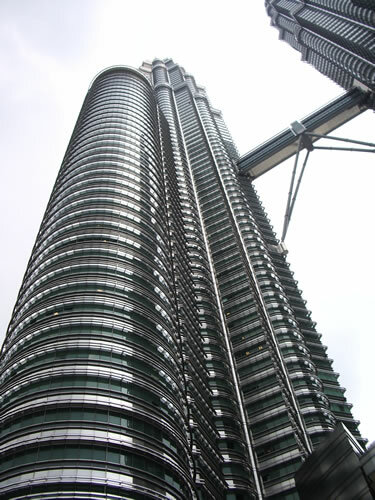 The brightest, shiniest objects in Malaysia, are KL’s Petronas Towers, the world’s tallest twin towers. The view from the Skybridge that connects the two towers at the 41st floor provides an impressive overview of the city. Back at ground level I spent the day exploring KL’s colorful melange of British, Indian, Chinese, and Malay cultures all easily accessible from the Dataran Merdeka, Independence Square. 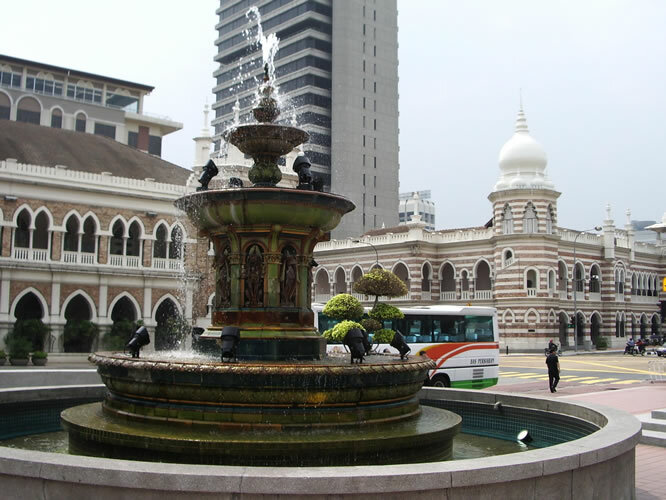 Just opposite the Sultan Abdul Samad building with its clock tower is the Royal Selangor Club where the British played cricket. From Merdeka it is just a short walk to Little India in one direction and Chinatown in the other direction. 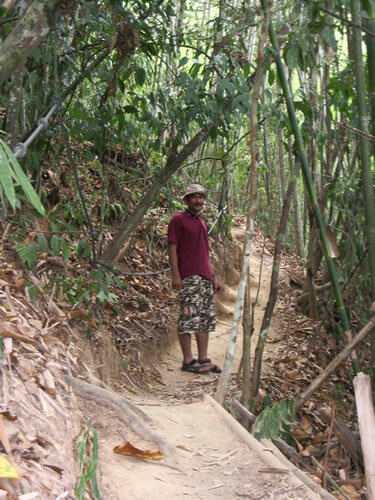 KL is fascinating but it is the "walk on the wild side" that had the greatest appeal. 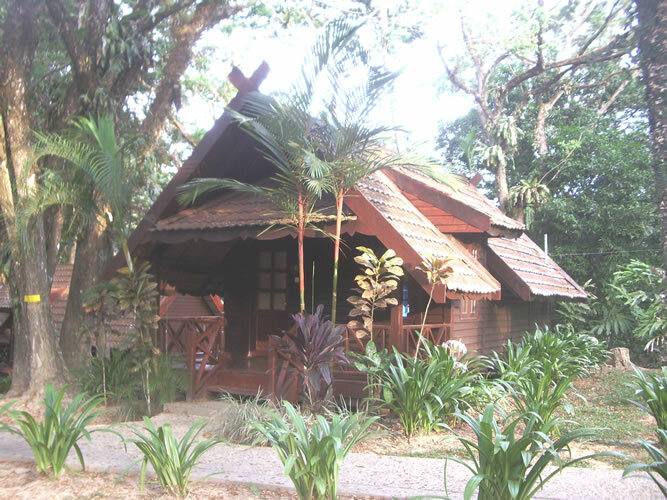 Three hours from modern, eclectic KL is Taman Negara. The modern highways leading to Taman Negara made me wonder if the rainforest could really be "virgin." I arrived at Kuala Tembeling Jetty, purchased a park permit, and climbed down the steps to the dock that, due to the low water level, was more like a slide. 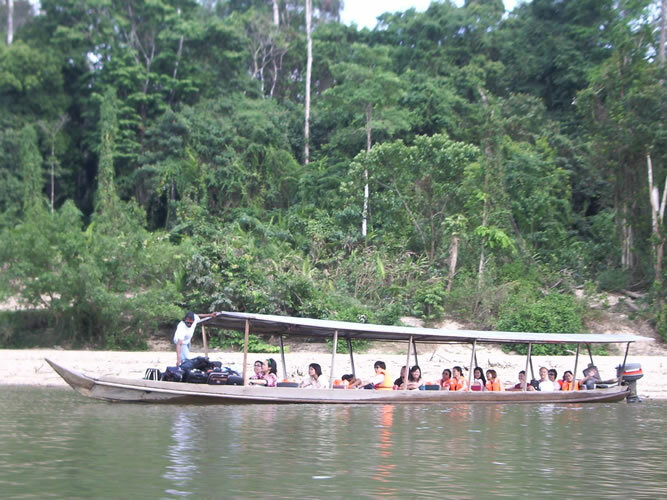 Loaded with luggage and a dozen passengers the boat headed up the Tembeling River. For nearly four hours I was the star in my own National Geographic documentary. Between walls of green the boat motored up river, the breeze offering respite from the heat and humidity. People fished with nets and poles. Children refreshed themselves splashing near the shore. Water buffalo with only horns and nose sticking out of the water avoided the sun. Other boats whizzed by. We passed an adventurous group poling along on bamboo rafts, others were kayaking and tubing. The ride was beautiful with an occasional bit of white water to add a momentary thrill. All too soon the trip was over. Only minutes after the boat docked at Mutiara Taman Negara I was soaked in perspiration and as I lugged my luggage up the steps I wondered if I only liked the rainforest on TV. Did I only enjoy the "rainforest of my mind?" Sometimes I am not realistic about how much I am willing to rough it. At the top of the steps I caught my breath, looked around, and heaved a sigh of relief as I took in Mutiara Taman Negara Resort’s large modern open-air dining area and landscaped grounds with a walkway that meanders from cabin to cabin. My cabin had electricity, a hot shower, "flushies," and, best of all, air conditioning. I flopped on the bed and welcomed the a/c but then tinges of disappoint began to surface. How could this be the oldest rainforest with all these conveniences? Not to worry because from the resort it is only a short walk back 130 million years. A video documentary explained the dynamics of Taman Negara where more than 10,000 plant species and about 350 animal species make their home. However, spotting big animals like the wild elephants and members of the cat family is highly unlikely. But there was nothing to keep the macaques from making the resort their playground or an occasional monitor lizard wandering around. In the morning I set off with Jo, my guide, for a three-hour nature walk. We set an easy pace, stopping for mini-lessons to learn about the various plants and their uses and to inspect a wide array of bugs I never would have noticed without the Jo’s keen eyes. Amid this "jungle" is the world’s longest canopy walk, about 1500 feet, most of which is between 90 and 120 feet above the forest floor. Gingerly, I started off on the wobbly, narrow boardwalk with high net sides, keeping a required 15 feet behind the person in front of me. The canopy walk goes from tree to tree with a viewing platform encircling each tree. 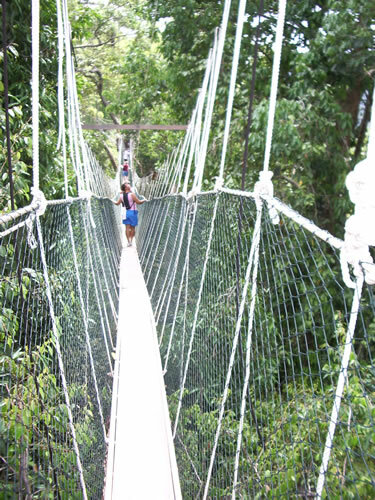 It took a while to feel secure enough to enjoy the experience of being in the rainforest canopy. Returning to camp it was time for a shower, as short rest and lunch. There are a variety of things to do in Taman Negara including visiting caves, cooling off in swimming holes, and white water rafting. 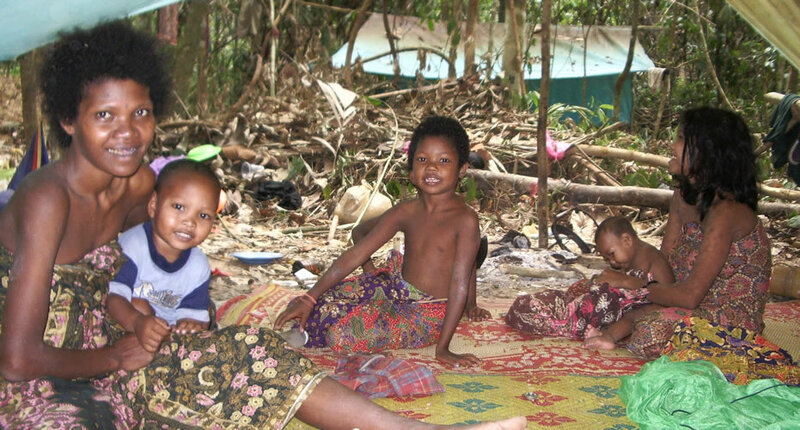 I opted to visit the aborigines or "Orang Asli," which means "original people" in the Malay language. They were the first known human occupants on the Malay Peninsula and continue to live a nomadic, hunter-gather lifestyle. The Batek, as they call themselves, are a gentle and shy people. The "village" was home to about 20 people. At first the children hid behind the adults so I took off my shoes and sat on the edge of the mat under their lean-to shelter. Soon curiosity replaced fear and they began to smile. 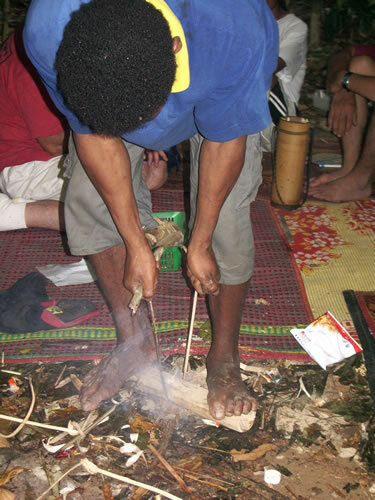 One of the Batek men showed me how they make fire without using matches and how he makes poison darts for his blow gun used for hunting. The Malaysian government has tried to provide schools but it is not in accord with their nomadic ways. Once a month the government sends a doctor to check on their health and give them medicine however, they prefer their traditional medicines made from plants they find in the rainforest. After dinner Jo and I headed out for a night nature walk. At a "hide," a one-room structure on stilts overlooking waterholes and natural salt licks, we watch samba deer. There are several hides in the park where visitors can spend the night should they so desire. Once again Jo’s amazed me with his ability to find scorpions, spiders, moths, walking sticks, and an incredible array of interesting little "critters," each with their own special adaptive survival characteristics. There was no joy in leaving. Once again on the river, enjoying the river vignettes and disappointed because of the things I didn’t do in Taman Negara, I put Taman Negara on my "gotta’-do-again" list.